From the Department of Neurology (V.P.C., N.A., A.T.R., A.J. ), and Department of Pathology (P.P. ), University of Chicago, IL. Chronic lymphocytic inflammation with pontine perivascular enhancement responsive to steroids (CLIPPERS) is a rare CNS inflammatory syndrome first described in 2010 by Pittock et al.1 Taieb et al.2 reported about 60 known cases throughout the world. The underlying pathogenesis of CLIPPERS has not been fully elucidated, and a neural autoantibody target has not been discovered. Steroid treatment is effective in treating the inflammatory component of the disease, but long-term treatment of CLIPPERS with steroids is limited by side effects. Steroid withdrawal is associated with recrudescence of the disease, and each relapse is associated with additional disability. Moderately efficacious steroid-sparing treatments include methotrexate, hydroxychloroquine, and cyclophosphamide.2 However, the long-term efficacy and safety of these agents in CLIPPERS remain to be determined. Anti-CD20 molecules benefit several antibody-mediated CNS inflammatory diseases. Herein, we describe a case of CLIPPERS successfully treated with rituximab (mouse chimeric anti-CD20 monoclonal antibody) over the course of 4 years. We describe imaging and histological features of this disease, as they are relevant to disease pathology and treatment (figure). (A) Pretreatment T1-weighted MRI shows curvilinear, punctate gadolinium contrast enhancement, predominantly in the pons. (B) Pretreatment T2-weighted MRI shows multiple T2 hyperintense lesions in the brainstem. (C) Posttreatment T1-weighted MRI shows resolution of previously enhancing areas of the brainstem. (D) Posttreatment T2-weighted MRI shows faint, patchy T2 hyperintensities in the areas of previous contrast enhancement in the pons. (E, F) Low- and high-power images of the H&E-stained slides (original magnification ×100 and ×200, respectively) of the left parietal brain biopsy showing with prominent small perivascular lymphocytes and more diffuse infiltration by macrophages. (G) Most of the lymphocytes label as CD3+ T cells (original magnification ×200). (H) Many of these T cells express CD8 (original magnification ×400). (I) There is a paucity of CD20+ staining B cells in the sample (original magnification ×200; the same region shown in G). (J) CD68 confirms the presence of numerous foamy macrophages (original magnification ×200). A 28-year-old woman had subacute development of vertigo, gait ataxia, dysesthesia, and generalized weakness. She had partial left abducens palsy, right-sided pronator drift, numbness, dysmetria, and dysdiadochokinesia. Her gait was ataxic. MRI revealed numerous punctate, contrast-enhancing T1 lesions in the pons, midbrain, medulla, and cerebellum, as well as the cervical and thoracic spine. There was mild leptomeningeal enhancement in the posterior fossa. CSF analysis revealed a protein level of 59 mg/dL, a WBC count of 5 cells/µL with 91% lymphocytes and 9% monocytes, and negative oligoclonal bands. 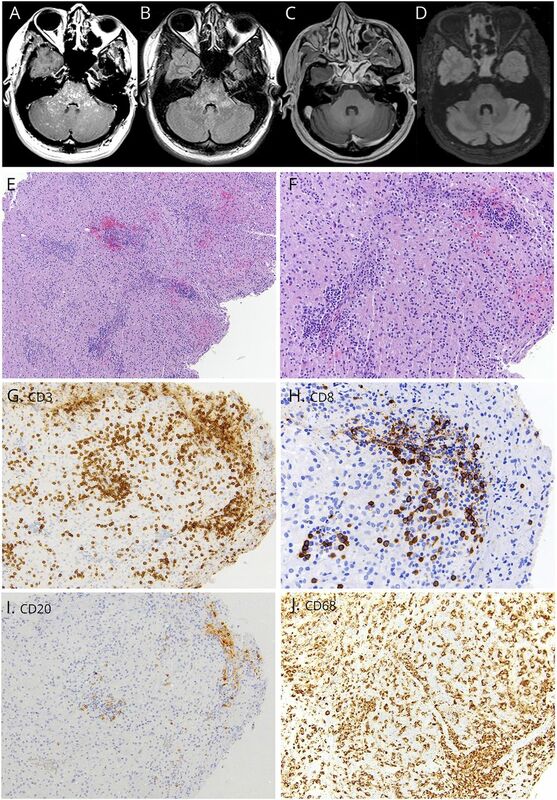 Brain biopsy revealed prominent patchy, perivascular lymphocytes, the majority of which were CD3-positive T cells. Only a few CD20-positive B cells were present. Some brain areas showed infiltration by foamy macrophages, with loss of myelin but preservation of axons. Based on MRI and histological analyses, she met the current proposed diagnostic criteria for CLIPPERS.3 She was treated with 5 days of IV methylprednisolone followed by a long taper of oral steroids over 5 months. The patient's symptoms improved significantly while on steroids. However, once she was weaned off oral steroids, she had recurrence of her gait ataxia, associated with MRI worsening. She was then treated with 1,000 mg of IV rituximab every 6 months for 2 cycles, but after 1 year of this regimen, an MRI revealed worsening punctate contrast-enhancing lesions in the posterior fossa. She broke through rituximab treatment, although her CD19 count was zero at the time of relapse. At the time of the relapse, she was first treated with IV methylprednisolone and then with 1 g of rituximab 2 weeks apart. Her rituximab dosing frequency was escalated to 1,000 mg every 4 months for the next 4 years, and she showed clinical and radiologic improvement and stability of the disease. She has had no side effects to rituximab. Our case demonstrates the long-term effectiveness of anti-CD20 monoclonal antibodies in treating CLIPPERS. Taieb and colleagues also described a case of CLIPPERS in a young man, followed for over 400 months, with very active relapsing disease before starting rituximab who became relapse-free after treatment.4 In our case, histopathologic analysis of the CLIPPERS lesion showed abundant T cells, with little evidence of B cells. Yet, an agent that specifically causes B-cell depletion was highly efficacious in what appears to be a T-cell–mediated disease. This is consistent with current theory that B cells are important regulators of T-cell activity. B cells are involved in T-cell antigen presentation and costimulation, and B-cell depletion therapy changes the proportion of autoreactive T cells that produce inflammatory cytokines.5 A subset of T cells (about 5%) actually express CD20 antigens, which could also be depleted by anti-CD20 antibodies.6 We suggest that anti-CD20 agents may also affect T-cell function in CLIPPERS, a disease largely mediated by T cells. Although a randomized comparative treatment trial is not possible with this rare disease, our case adds to the evidence that anti-CD20 therapy is effective in the long-term treatment of CLIPPERS. This provides Class IV evidence. This is a single observational study without controls. Veronica Cipriani: manuscript author and acquisition of data. Nancy Arndt: acquisition of data. Peter Pytel: acquisition of pathology slides and figure design. Anthony Reder: critical revision of the manuscript for intellectual content. Adil Javed: study concept and critical revision of the manuscript for intellectual content. V. Cipriani received research support from the National MS Society. N. Arndt served on the scientific advisory board of Genzyme and Bayer; received travel funding and/or speaker honoraria from Genzyme and Teva; and served on the speakers' bureau of Genzyme and Teva. P. Pytel served on the editorial board of Modern Pathology; received research support from the NIA; and served as an expert witness. A.T. Reder served on the scientific advisory board of, consulted for, and received travel funding and/or speaker honoraria from Abbott, Questcor/Mallinckrodt, AstraZeneca, Merck Serono, Athena Diagnostics, Sanofi Aventis, Bayer, Biogen, BioMS Medical Blue Cross Blue Shield, Boehringer Ingelheim, Caremark, Centocor Ortho Biotech, Cephalon, Connetics, CroMedica Global, Eli Lilly and Company, Elan Corporation, Genentech, Genzyme, GlaxoSmithKline, Hoechst Marion Roussel Canada Research, Roche, Immunex, Institute for Health Care Quality, Johnson & Johnson, Yale University, Barrow Neurological Institute, National Multiple Sclerosis Society & Paralyzed Veterans of America, Neurocrine Biosciences, Novartis, Parke-Davis, Pfizer, Pharmacia & Upjohn, Protein Design Labs, Quantum Biotechnologies, Quintiles, EMD Serono, Senton, Smith Kline-Beecham, Specialized Therapeutics, Takeda Pharmaceuticals, and Teva; served on the editorial board of Medlink Neurobase, Turkish Journal of Medical Sciences, and Türk Nöroloji Dergisi; received research support from Novartis, Bayer, Serono, Chugai, Genzyme, Biogen, Medimmune, Genentech/Roche, MedDay, NIH/NINDS, NIH, Chinese Government, Turkish Ministry of Defense, State of Illinois, National MS Society, Brain Research Foundation, American Academy of Allergy & Immunology, Howard Hughes Foundation, and Egypt Arab Republic Peace Fellowship. A. Javed consulted for Biogen, Sanofi Genzyme, Serono, Mallinckrodt, and Genentech and served on the speaker's bureau of Biogen, Sanofi Genzyme, Serono, Teva, Mallinckrodt, and Genentech. Veronica Cipriani reports no disclosures. Nancy Arndt has received honoraria or served as a consultant for Teva, Bayer, Biogen, Genzyme, and Genentech. Peter Pytel reports no disclosures. Anthony Reder has received honoraria or served as a consultant for Merck/Serono, Genentech, Teva, Genzyme, Mallinckrodt, Novartis, Bayer, Chugai, MedImmune, MedDay, and Biogen. Adil Javed has received honoraria or served as a consultant for Merck, Genentech, Teva, Genzyme, Mallinckrodt, Novartis, Chugai, MedImmune, MedDay, and Biogen. Full disclosure form information provided by the authors is available with the full text of this article at Neurology.org/NN. Funding information and disclosures are provided at the end of the article. Full disclosure form information provided by the authors is available with the full text of this article at Neurology.org/NN. The Article Processing Charge was funded by the authors. Accepted in final form January 17, 2018. This is an open access article distributed under the terms of the Creative Commons Attribution-NonCommercial-NoDerivatives License 4.0 (CC BY-NC-ND), which permits downloading and sharing the work provided it is properly cited. The work cannot be changed in any way or used commercially without permission from the journal.
. Chronic lymphocytic inflammation with pontine perivascular enhancement responsive to steroids (CLIPPERS). Brain 2010;133:2626–2634.
. Therapeutic approaches in CLIPPERS. Curr Treat Options Neurol 2017;19:17.
. Diagnostic criteria for chronic lymphocytic inflammation with pontine perivascular enhancement responsive to steroids (CLIPPERS). Brain 2017;140:2415–2425.
. Long-term outcomes of CLIPPERS (chronic lymphocytic inflammation with pontine perivascular enhancement responsive to steroids) in a consecutive series of 12 patients. Arch Neurol 2012;69:847–855.
. Effector and regulatory B cells: modulators of CD4+ T cell immunity. Nat Rev Immunol 2010;10:236–247.
. Rituximab efficiently depletes increased CD20-expressing T cells in multiple sclerosis patients. J Immunol 2014;193:580–586. NOTE: All contributors' disclosures must be entered and current in our database before comments can be posted. Enter and update disclosures at http://submit.nn.neurology.org. Exception: replies to comments concerning an article you originally authored do not require updated disclosures.